Fox Searchlight announced on Wednesday that it has signed a first-look production deal with Element Pictures for all theatrical films. Element Pictures, run by Ed Guiney and Andrew Lowe, is the production company behind Sebastian Lelio’s recent film “Disobedience,” starring Rachel Weisz and Rachel McAdams; Yorgos Lanthimos’ “The Killing of the Sacred Deer” and “The Lobster,” as well as “Room,” which won Brie Larson the Oscar for best actress. Matthew Greenfield and David Greenbaum, Fox Searchlight co-presidents of production for film and TV, made the announcement that the Dublin and London-based company, working across production, distribution and exhibition, would bring its unique point of view to Fox Searchlight. Element Pictures is currently working with Fox Searchlight Pictures, Film4, Waypoint Entertainment and producers Ceci Dempsey (of Scarlet Films) and Lee Magiday on Lanthimos’s quirky period drama “The Favourite,” which is set to open the 56th New York Film Festival on Friday. Starring Olivia Colman, Emma Stone and Rachel Weisz, the film is set for a Nov. 23 North American release and Jan. 1, 2019 release in the U.K. The deal comes as Fox Searchlight and a handful of other TV and film entertainment assets prepare to merge with Disney, following the company’s $71.3 billion acquisition of the Fox assets. The deal is expected to close around the end of the year, at which point Fox Searchlight will be under Disney’s thumb. It’s not yet clear exactly how Disney plans to fold Fox Searchlight and the other assets into its current businesses. Farrell's big break came playing villager Danny Byrne in the Irish TV series. In his first U.S. starring role, Farrell played a draftee in 1971 going through Advanced Infantry Training at Fort Polk, aka Louisiana's infamous Tigerland, the last stop for soldiers heading to Vietnam. The Dublin-born actor got his first big exposure with American audiences playing Jesse James in 2001's "American Outlaws"
Farrell sealed his movie star status when he co-starred with Tom Cruise in 2002 Steven Spielberg film, "Minority Report." He went on to shave his head for a villainous turn in the 2003 film adaptation of Marvel's "Daredevil." Farrell took no prisoners as a tough cop in 2003's "S.W.A.T." alongside Samuel L. Jackson and Michelle Rodriguez. After a string of hits, Farrell bombed spectacularly in Oliver Stone's Alexander the Great biopic. Farrell teamed up with Jamie Foxx in the 2006 film remake of "Miami Vice." His role as a remorseful hitman in the critically acclaimed 2008 black comedy "In Bruges" garnered cult status. Farrell let his comedic side shine through as abusive boss Bobby Pellitt in "Horrible Bosses." In the 2012 remake of "Total Recall," Farrell took over the role originally played by Arnold Schwarzenegger in 1990. In John Lee Hancock's drama, Farrell plays the imaginative but alcoholic father of "Mary Poppins" author P.L. Travers -- an Australian ne'er-do-well whom she idealizes despite his flaws. Returning to TV, Farrell plays corrupt Det. 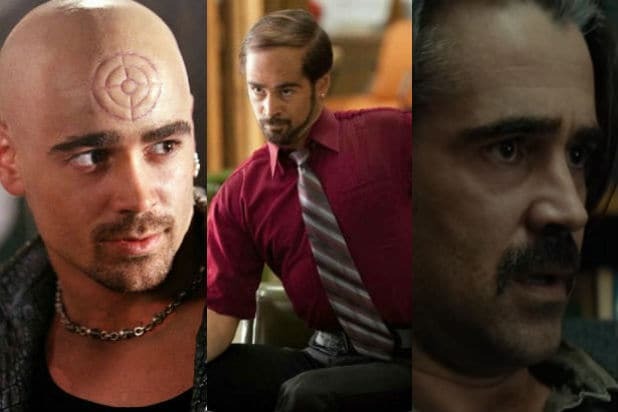 Ray Velcoro in Season 2 of the HBO anthology series "True Detective"
Farrell stars in this art-house hit about a just-dumped man in a society where he has 45 days to find his true love or be turned into an animal of his choice.